(Newser) – The John McCain-Snooki Twitter lovefest continues. The Arizona senator tweeted a happy birthday message to the Jersey Shore star yesterday, to which she quickly replied, "Thabk you Johnny ! :) xox." She later defended McCain from some apparently negative publicity that resulted from his tweet: "Everyone get real with given @SenJohnMcCain bs for wishing me happy bday, fricken weirdos. #teammccain :) thanks." To relive their storied relationship from the beginning, click here to read about the first tweets they exchanged (about tanning ... swoon! ), here to read about the time she called him "really cute," or here to read about how he thinks she's "too good-looking to go to jail." 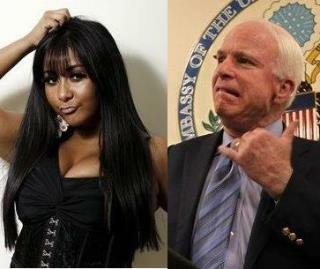 Wonder whose responsibility it is in McCain's office to be up to date on all things Snooki? Sounds like a pretty cushy job. Oh, will you drop it already. None of these tweets are actually creepy or remarkable, it's just that it's these two revolting idiots. Two revolting idiots that don't even need to tweet to be creepy. They don't need to interact with each other in any way to be creepy. They don't even need to be aware of each others existence to be creepy.